If you have created a whisky fantasy in your mind, have a whisky society or meetup where you live, or frequent online whisky fora, websites, and blogs you have no doubt thrown around the idea of sharing wee samples with other enthusiasts by mail. Well, imagine the same concept mixed with my favourite pub and/or household game (blind tasting and guessing) and you are close to what Doug Stone, friend and founder of the For Scotch Lovers website, has created with his Whisky Explorers Club. I read the press release, spoke with Doug, did some math and then happily joined as the price seemed totally worth it for the enjoyment of the activity. A group of friends also joined so we all look forward to each shipment of treats. This morning I received an email saying Flight #3 was already on its way. Time flies! If you are not a member, let me paint a picture of the club. So once our whisky is poured and we are logged into the IQ page, we answer a series of multiple choice questions: how does it look? feel? taste? smell? do you like it? Then we get to guess from a shortlist, what whisky we think we were having. All of these answers popoulate your final "Whisky IQ", based on your correct answers, if and when such answers can be said to exist. So the next page gives your score and tells you the answers they were looking for. Satisfying. Fun. Geeky as hell. But from this screen there is no link to start again with another whisky, just links to BUY the whisky, and, incidentally as I tried sample 0210WY23 while walking you through, a quote from and link to this site. While the whole experience was enjoyable, I was left asking, "so what?" Like, now what? There is no community context putting my Zen Master IQ into perspective, no way to view others' comments, no forum, no nothing. Just "here's your whisky, answer some questions for us, and bye bye. " Still, overall, the game is fun, easy, and I am totally happy with my membership and look forward to each package. It is amazing fun and is a great easy gift for a whisky geek in your life. But the club is still in its infancy, so as members I know Doug is keen to hear our thoughts, so here are a few things that would make it more enjoyable, at least for me. - make getting into the IQ game easier once logged in, ie via a logo or link in the MY or COMMUNITY windows on right. - make starting another product OR joining a forum discussion OR viewing others' scores easier from the last page of the IQ results. - don't make me answer the golden questions (male/female, how often do you drink, etc.) more than once, ie. the first time I log in. Beyond that, go join. It's fun and the more members, the more enjoyable the whole thing will be for all of us. My husband's a whiskey drinker, and I thought this would make a great gift for him. The one thing I know is that he's not a huge fan of scotch--he goes more for bourbons (Baker's is his favorite) and some Irish whiskeys. Based on your experience with this club, do they send you all kinds of whiskey or just scotches. Sorry, not being much of a whiskey drinker myself, I'm not even sure if I'm throwing these terms around correctly. Any info is appreciated. Thanks! Flipsockgrrl: Yes, only for USA as far as I know. 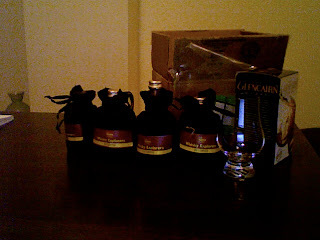 Look at Master of Malt online for a similar club of sharing minis. Jennifer: Yes, the club has all sorts of whiskies but the fun in the gift is that he may, if tasted blind, find a scotch that he does like. There are 100 distilleries after all! Good luck. Great idea! You get to know a few great Scotches and sometimes need to try something new. This will help. Love to give it a try. Thanks.